Merandy (MURR-an-DEE) Sosa Gonzalez...enjoys billiards, travel, and cooking. Spent majority of season at Double-A Jacksonville, posting a 3-6 record and 4.32 ERA (73.0 ip/35 er) with 47 strikeouts in 14 starts...In three stints with Miami, went 2-1 with 5.73 ERA (22.0/14) and 19 strikeouts over eight appearances (one start)...Made Major League debut on April 19 at Milwaukee after being recalled from Jacksonville that day. Allowed three hits with one strikeout over 2.0 shutout innings out of the bullpen...Earned first career win on April 25 at Los Angeles Dodgers, allowing three earned runs on five hits (one home run) and a walk, over 3.0 innings...Struck out season-high seven batters over 3.0 relief innings on May 9 at Chicago Cubs ...Posted 2-0 record, with a 4.85 ERA (13.0/7) in six relief outings before being optioned back to Jacksonville on May 10...Was on 7-day disabled list from May 17-June 5 due to blisters...Made one relief appearance in second stint with Miami, on June 17 at Baltimore. Allowed four earned runs on five hits over 4.1 innings...Upon return to Jumbo Shrimp, went 3-5 with a 4.67 ERA (52.0/27) with 32 strikeouts in nine games from June 24-August 8. ..Tossed season-high 7.0 innings on July 11, allowing just three hits and no runs...Had a season-high nine strikeouts in 5.2 frames on July 16 vs. Biloxi ...Allowed three earned runs over his last three starts before being recalled by Miami on August 13, tossing exactly 7.0 innings in each outing ...Suffered the loss in his first Major League start on August 13 at Atlanta after allowing three earned runs on eight hits (one home run) and three strikeouts over a career-high 4.2 innings. Combined on 13-3 record with one save and a 1.66 ERA (130.1 ip/24 er) in third professional season, seeing time at Single-A levels in both Mets' and Marlins' systems...Established career bests in ERA, appearances (22), starts (20), innings pitched and strikeouts (103)...Began season with Columbia and was promoted to St. Lucie prior to being acquired from Mets...Over first four starts of season, tossed 28.1 scoreless innings, allowing just 15 hits and three walks while striking out 23. Went 4-0 with 0.00 ERA (28.1/0) in four April starts, earning Southern League Player of the Month honors. Struck out 23 while holding opponents to a .160 average. ..Tied career high with 7.2 scoreless innings on April 15 at Augusta. Surpassed previous high of 7.0 innings, last done on April 21 vs Lexington...Had scoreless streak snapped after allowing season high seven runs on May 3 vs. Delmarva. Surrendered just five hits over 5.0-inning outing, yet three were home runs.. Fanned career-high 10 batters on May 31 against Augusta, allowing one earned run on nine hits over 6.0 innings. ..Named South Atlantic League Midseason All-Star after going 8-1 with 1.55 ERA (69.2/12) in 11 starts before break. ..Promoted to St. Lucie on June 22 and made debut on June 24 at Charlotte. Took loss after surrendering one run and four hits over 6.0 frames...Won next four starts, allowing more than one earned run just once. Over those four starts, allowed just four earned runs (eight total) over 23.2 innings (1.52 ERA)...Assigned to Single-A Jupiter following acquisition from Mets...Made Hammerheads' debut on August 3 at Fort Myers, working 5.0 innings. Allowed one unearned run on three hits, with two walks and one strikeout. ..Made first relief appearance of season on Aug. 13 vs. Florida, tossing 4.0 scoreless innings with no walks and four strikeouts...Earned second career save in next relief outing, Aug. 18 at Florida. Tossed 4.0 scoreless with four strikeouts and just three hits. April 8, 2019 RHP Merandy Gonzalez assigned to Springfield Cardinals from Palm Beach Cardinals. 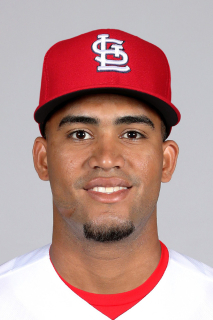 April 3, 2019 RHP Merandy Gonzalez assigned to Palm Beach Cardinals from Springfield Cardinals. March 28, 2019 St. Louis Cardinals claimed RHP Merandy Gonzalez off waivers from San Francisco Giants. March 28, 2019 St. Louis Cardinals optioned RHP Merandy Gonzalez to Springfield Cardinals. March 25, 2019 San Francisco Giants designated RHP Merandy Gonzalez for assignment. March 8, 2019 San Francisco Giants optioned RHP Merandy Gonzalez to Sacramento River Cats. March 2, 2019 San Francisco Giants claimed Merandy Gonzalez off waivers from Miami Marlins. October 2, 2018 Miami Marlins recalled RHP Merandy Gonzalez from Jacksonville Jumbo Shrimp. August 20, 2018 RHP Merandy Gonzalez assigned to Jacksonville Jumbo Shrimp from New Orleans Baby Cakes. August 14, 2018 RHP Merandy Gonzalez returned to New Orleans Baby Cakes from Miami Marlins. August 13, 2018 Miami Marlins recalled Merandy Gonzalez from Jacksonville Jumbo Shrimp. June 18, 2018 Miami Marlins optioned RHP Merandy Gonzalez to Jacksonville Jumbo Shrimp. June 15, 2018 Miami Marlins recalled Merandy Gonzalez from Jacksonville Jumbo Shrimp. June 5, 2018 Jacksonville Jumbo Shrimp activated RHP Merandy Gonzalez from the 7-day disabled list. May 17, 2018 Jacksonville Jumbo Shrimp placed RHP Merandy Gonzalez on the 7-day disabled list retroactive to May 15, 2018. Blister. May 10, 2018 Miami Marlins optioned RHP Merandy Gonzalez to Jacksonville Jumbo Shrimp. April 19, 2018 Miami Marlins recalled Merandy Gonzalez from Jacksonville Jumbo Shrimp. March 9, 2018 Miami Marlins optioned RHP Merandy Gonzalez to Jacksonville Jumbo Shrimp. November 20, 2017 Miami Marlins selected the contract of Merandy Gonzalez from Jupiter Hammerheads. July 29, 2017 RHP Merandy Gonzalez assigned to Jupiter Hammerheads. June 22, 2017 RHP Merandy Gonzalez assigned to St. Lucie Mets from Columbia Fireflies. April 2, 2017 RHP Merandy Gonzalez assigned to Columbia Fireflies from Brooklyn Cyclones. June 16, 2016 RHP Merandy Gonzalez assigned to Brooklyn Cyclones from Kingsport Mets. July 10, 2015 RHP Merandy Gonzalez assigned to Kingsport Mets from GCL Mets. June 22, 2015 RHP Merandy Gonzalez assigned to GCL Mets. July 8, 2014 RHP Merandy Gonzalez assigned to DSL Mets1 from DSL Mets2. June 1, 2013 RHP Merandy Gonzalez assigned to DSL Mets2 from DSL Mets1. June 1, 2013 DSL Mets2 activated RHP Merandy Gonzalez. March 6, 2013 New York Mets signed free agent RHP Merandy Gonzalez to a minor league contract.